Alchemilla mollis, or the Lady's Mantle provides a striking color and texture to the garden with the lacy lemon-green flowers and the gray green foliage. This is a relatively easy plant to grow and the flowers are popular with flower arrangers. 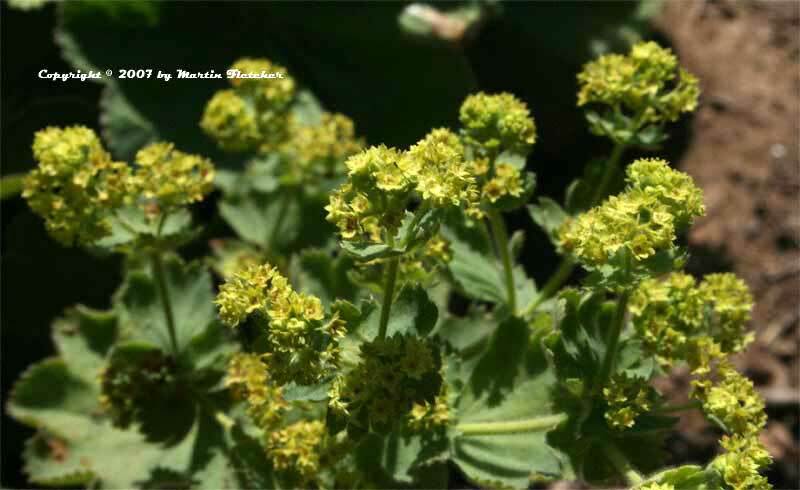 Alchemilla mollis will perform well in full sun or light shade at the coast, inland the Lady's Mantle prefers a little more shade or at a minimum, regular water. Alchemilla mollis is not overly particular about soils and is hardy to zone 3, well below anything we are likely to get here. Alchemilla mollis grows to about a foot tall and will gradually spread to 2 feet. Flowers and foliage of Alchemilla mollis the Lady's Mantle. High resolution photos are part of our garden image collection.